These light, crisp, nubbly-textured waffles, by themselves or with fried chicken, are a mainstay on the menu at Oakland’s Brown Sugar Kitchen. Chef Tanya Holland, fresh off Season 15 of Top Chef, shared the recipe with us, along with her famous apple cider syrup (adapted here from (Chronicle Books, 2014). She threw in a couple of extra toppings, just to be nice. Sprinkle active dry yeast over 6 tbsp. warm water (120°). Set aside until foamy, about 10 minutes. Whisk cornmeal with flour, salt, and sugar in a bowl. In another bowl, whisk to­gether egg, egg white, and milk; then whisk in yeast mixture. Gradually whisk in dry mixture until thoroughly combined. Whisk in butter until just combined. Chill batter overnight. 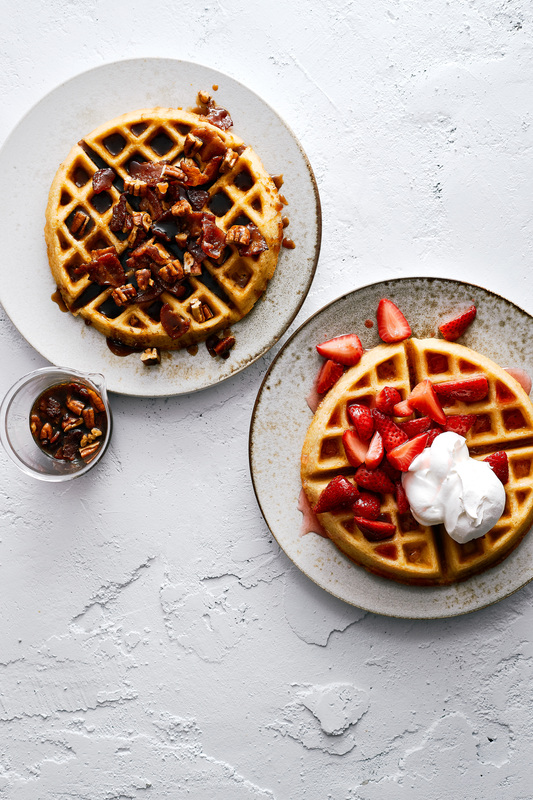 Whisk baking soda into batter, then cook waffles ac­ cording to your iron’s instruc­tions. Set wire racks over 2 baking sheets. Transfer waffles to baking sheets as they’re done and put in oven to crisp and keep warm. In a 10-in.-wide pot, bring brown sugar, apple cider vinegar, apple cider, cinnamon stick, and 2 tbsp. salted butter to a boil. Lower heat and simmer, uncovered and stirring occasionally, until just starting to foam and reduced to about 3/4 cup, 20 to 25 minutes. Discard cinnamon and serve warm. Slice strawberries into thin wedges and gently mix with 3 tbsp. sugar. Let sit 10 to 30 minutes, then pour in rosé. Let sit 10 minutes, then strain juices into a saucepan and reduce over medium heat until deep pink, slightly syrupy, and flavorful (4 to 7 minutes). Let syrup cool, then pour over strawberries. For the cream, whip cream with remaining 1 tbsp. sugar and the vanilla extract. Spoon strawberries and syrup onto waffles, pancakes, French toast, or crêpes and top with a dollop of vanilla whipped cream. Simmer brown sugar with 2/3 cup water until sugar dissolves and mixture thickens slightly, about 5 minutes. Add lemon juice, pecans, and bacon. Stir in a splash of bourbon if you like, and serve warm.